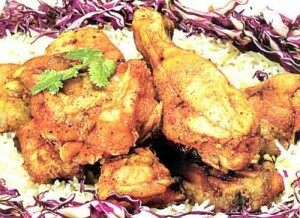 Dhuaan Chicken recipe by Umm Hashim at DesiRecipes.com. Mix the onion rings and vinegar and set aside. In a glass bowl, mix together the chicken , salt , garam masala, red chilli, zeera , dhania seeds, ajwain ,oil. On foil, place the coal so it is hot and smoking, place in the chicken mix bowl and now cover the bowl with a larger peice of foil so that the smoke traps into the bowl. let it smoke covered for about 20 mins. Uncover the bowl and discard the coal. Transfer the chicken mix to a cooking untensil and cook so the masala dries and the chicken is cooked. Now squeeze the excess vinegar from the onions and add to the chicken . Remove from heat, transfer to serving dish. You can garnish with dhania leaves and enjoy with fresh rotis....enjoy.